KAMPALA – In 2016, it was estimated that telecom companies in Uganda on an annual basis were losing about $60m due to the illegal redirection of international calls traffic. The amount in part led to revenue from voice services to remain flat or grow sluggishly in 2015, 2016 and 2017 – according to telecom revenue analysis in those three years. The illegal redirection is known in technical terms as SIM boxing. In this scenario, all operators – A, BICS, X, and the government receive their fees as per set agreements and taxation laws. 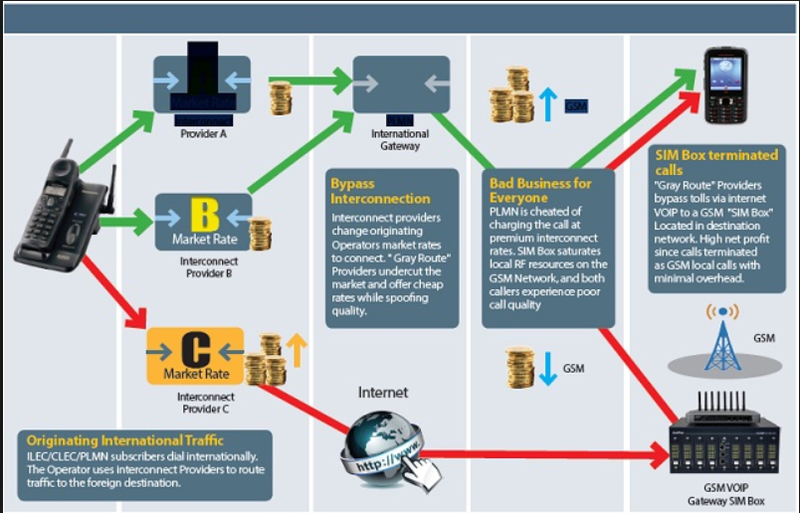 As stated, the telecoms were estimated to be losing about $60m annually as a result of the gray routing. A loss to the telecom means that they will also be unable to remit the excise duty charge on calls to the government. With the excise duty charge at about 36 percent, that means a government revenue loss of about $21.5m annually. These are amounts that can help the government continue to provide services for Ugandans. As the telecom operators and the government are counting their losses, the unscrupulous individuals that have only spent a meager amount to acquire a SIM box machine are reaping at the expense of legitimate business and causing financial loss to the government in the form of lost tax revenue. These SIM boxers can breakeven in less than 1 month and continue to rake in profits for years. There is no deliberate under declaration of telecom revenue because of the investment made in order to be compliant with the tax authorities. The efforts to reduce this vice has led to some arrests. In 2017, six individuals were arrested, and some convicted in court after they were found to have SIM box devices. They had up to 250 SIM cards that they used to re-route the calls. Increased surveillance by all the telecom companies and the Uganda Communications Commission (UCC) played a role in having these individuals arrested, however, the problem persists. The writer is an independent ICT consultant offering services to government entities, individuals and private companies. He is a seasoned telecoms Executive with, over 16 years’ broad expertise in the set up and operations of 2G, 3G and 4G Telecommunications networks right from network design, rollout, to operations.